A stroke or injuries to the central or peripheral nervous system may lead to paralysis in the shoulder. You experience pain and moving your arm is difficult for you. This results in pain in your shoulder area and restricts your arm movement. Dislocation of the shoulder joint from the socket is one reason for shoulder pain. The Omo Neurexa plus corrects the alignment of the humerus head with the joint socket and therefore alleviates the cause of the pain. It helps stabilise the shoulder and position it correctly again. The Omo Neurexa plus provides noticeable relief, alleviates pain and leads to a better overall body posture. Thanks to its special design, the orthosis can now be applied by patients themselves with one hand. The TriTech climate-regulating material counteracts heat development. This reduces perspiration and the orthosis can also be worn for longer periods of time. The strain relieving straps can be individually adjusted by your O&P professional for the best possible positioning of the shoulder. The Omo Neurexa plus was designed so that the orthosis can now be applied by the patient themselves with one hand as well. The Omo Neurexa plus provides noticeable relief and alleviates pain caused by the malposition of your shoulder joint. By bringing your shoulder into a better position, the orthosis combats the cause of your complaints. With the Omo Neurexa plus, your shoulder is securely stabilised. This means you can fully concentrate on movement and gait training. As a result, you can begin rehabilitation as soon as possible and learn the right movement patterns from the very start. By bringing your shoulder into the correct position with the orthosis, your entire body posture is corrected – which positively influences your gait. This helps you avoid one-sided excessive muscle strain or the overextension of nerves, ligaments and tendons. The orthosis is made of soft, washable fabric with silicone strips on the inside. This prevents slipping and rubbing. 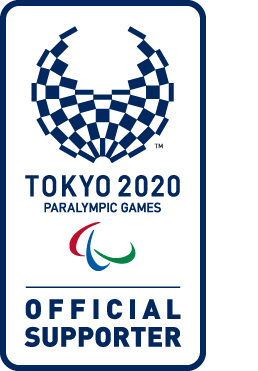 The climate-regulating material also counteracts perspiration and makes the orthosis comfortable to wear throughout the day. Thanks to its special design, you can put on the orthosis yourself with just one hand. Coloured snap fasteners make it easier to put it on correctly. Your therapist or O&P professional will adapt the orthosis to your individual needs and show you how to apply it correctly. 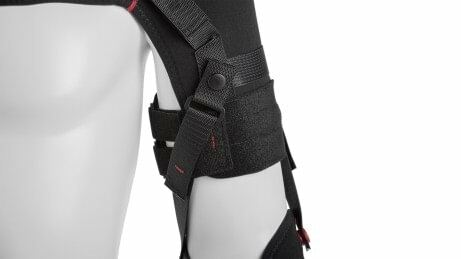 The Omo Neurexa plus shoulder orthosis is part of the Neurexa product line. It was developed in close cooperation with physicians and therapists – especially for stroke patients. As a valuable medical device for rehabilitation, it promotes active movement. Shoulder pain frequently occurs after a stroke or other illnesses. 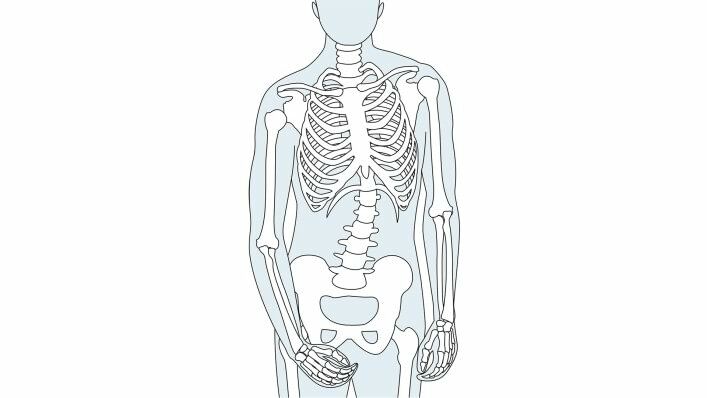 In this case the humerus is in an unfavourable position. The Omo Neurexa plus brings it back into the correct position, thereby eliminating the cause of the pain. This is essential in order to begin with early, targeted rehabilitation. Our objective is to help you reintegrate into your familiar social and work environment as quickly as possible. 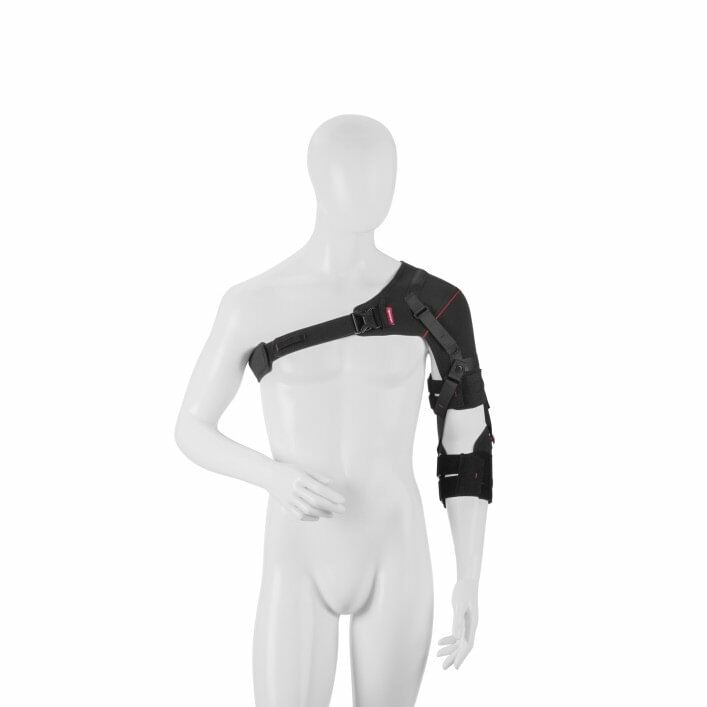 The Omo Neurexa plus consists of two parts – a shoulder cuff and a forearm cuff. They are connected by two straps. 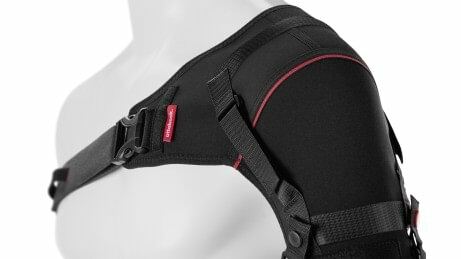 The orthosis covers a large area in the shoulder region, which has a positive effect on what are known as proprioceptors. These perceive how you move with your shoulder in space and what position you assume. This improves your overall body posture, which in turn has a positive impact on a smooth and uniform gait. 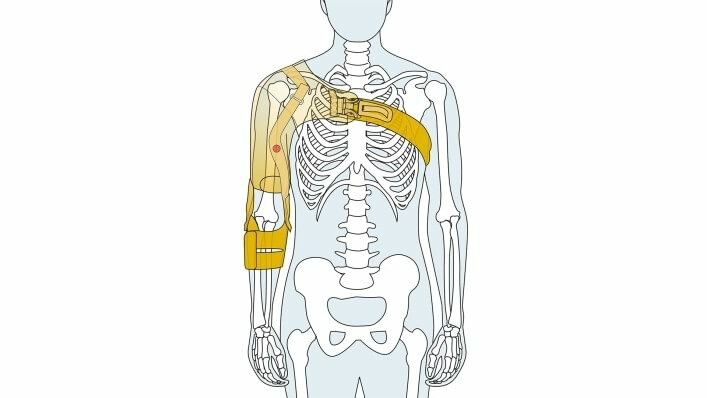 A muscle stimulation pad, which you can easily attach inside the shoulder orthosis with a hook-and-loop fastener, makes it possible to provide additional stimulation for weakened muscles.